No, this is not virtuoso guitar playing or singing and there’s no pedal steel, but it is brilliant in spirit and manages to maintain musicality. Creative genius of the song matched with performance genius of the band and the man. I am surprised heads didn’t explode from the raw energy. This is fun. Wow! In the beginning it was tame, but then later it really exploded! I’ve had sooo many Day In The Life’s that follow that same pattern! Maybe that’s why I can relate to this version. It’s perfect, and it’s the best Beatles cover I’ve ever heard. I think even Paul realizes he has just witnessed/participated in a sublime event. I thought you might like this, Fred. It's the backside of the Buffalo Springfield "Again" album. I think John and Paul are called out as the Nurk Twins. Don't know why. That brings back memories of my friends and I in middle school trying to figure out the deal with John and Paul being referred to as the Nurk Twins on the back of the album. Except the boys in the Springfield had it wrong - the word is "nerk." An English expression: "a foolish or insignificant person." It came from a 1950s BBC comedy called The Goon Show. If only the internet had existed back then. Worth reading. "John Lennon and Paul McCartney played their only gig as a double act, calling themselves The Nerk Twins – in front of an audience of just three people." Those boys were always so brave. 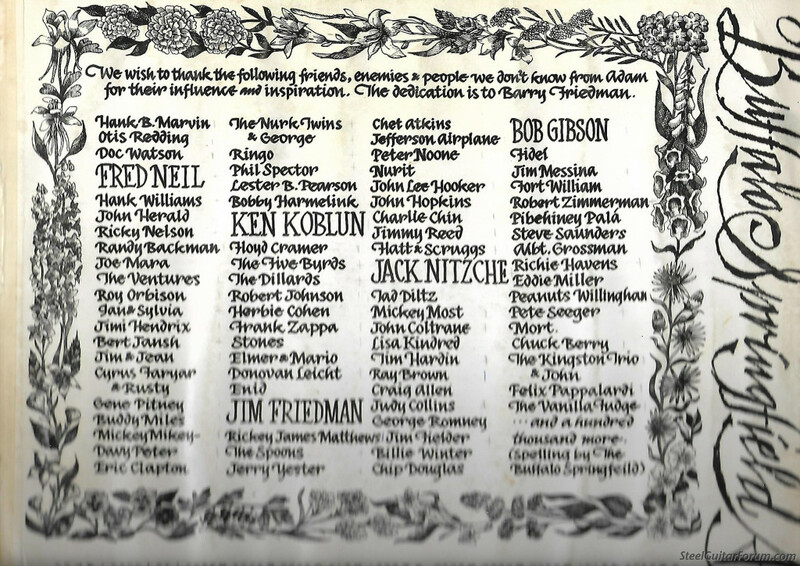 So did Neil Young replace Ben Keith a vibes player? This is from 2009, so Ben was still with us. I’m pretty sure that’s him at the keyboard, stage left/house right. You can see him briefly when Paul walks up to the mic during the bridge. Sure was a spontaneous combustion of a performance. 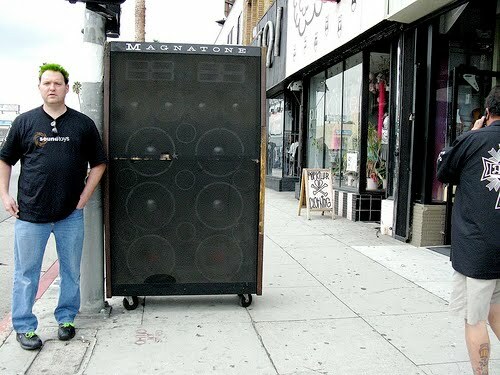 The size of that Magnatone speaker was unbelievably huge. What would we think if we really knew what that song meant and what the group was about. Thanks for the link Les. 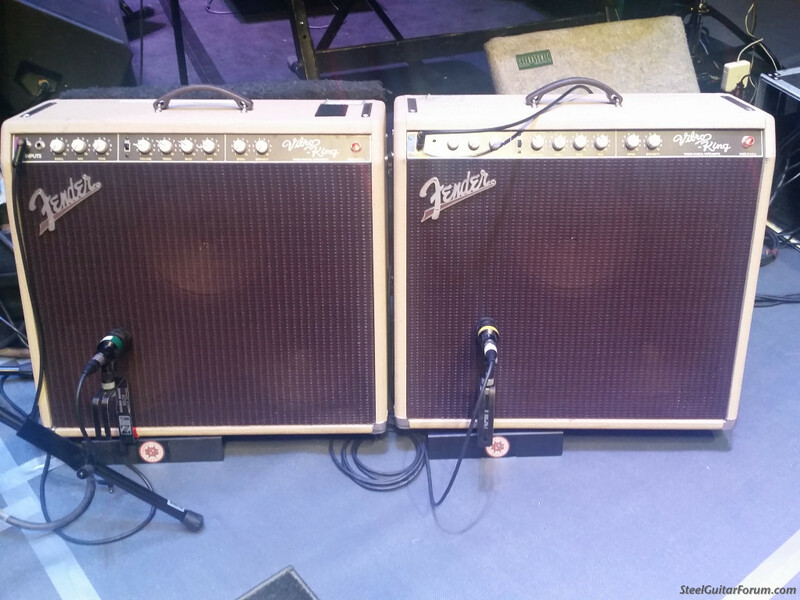 It appears that Neil has kept his gear likes the same as his old buddies CSN. I did production for CSN 4 years back and the old amps were all over the place. 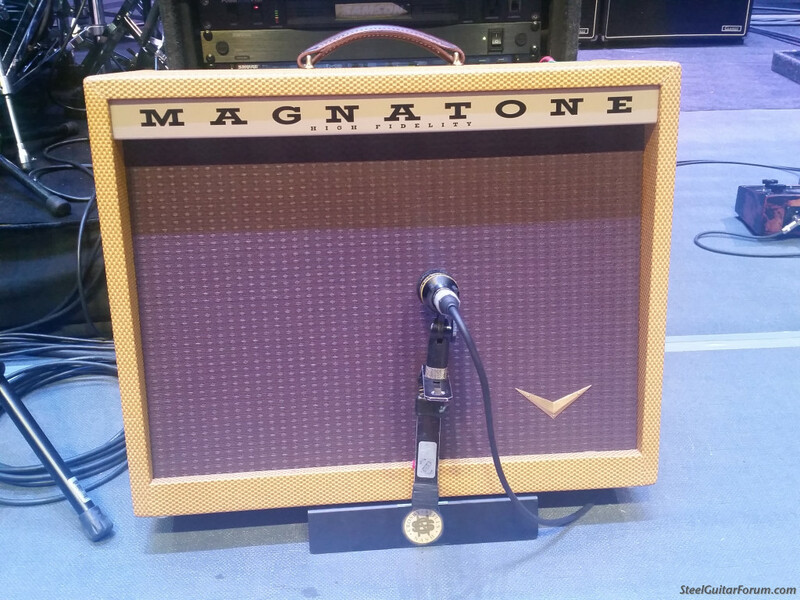 Although this appears to be a newer Magnatone, Nash has that Magnatone like. Stills otoh, has some great raggedy gear, below. 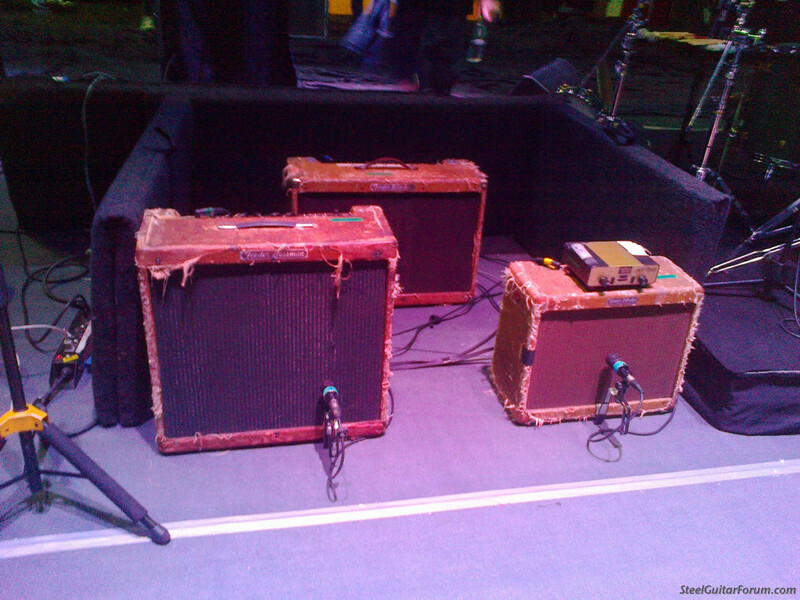 Stills' amps, old tweeds; a Twin-amp, (rear) Vibrolux and Bassman sit in a cubby hole that has a roof on it by show time spaced as you see them in the photo. He also has a rack behind these amps that connect to his pedal board. 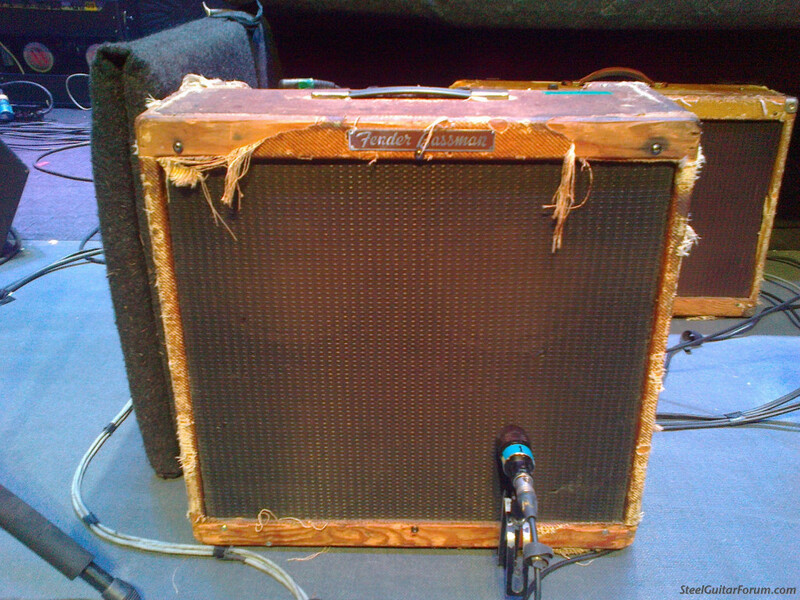 How many people has this amp seen? When ole' Neil played as CSN&Y wonder what that must've been like for dueling solos? Both Stills and Young have that take-no-prisoners swat attack blitzkrieg tone. That must be a mother to move and bet ya it has a flight case! The Baldwin Exterminator has the 2x15's 2x12's 2x8's. 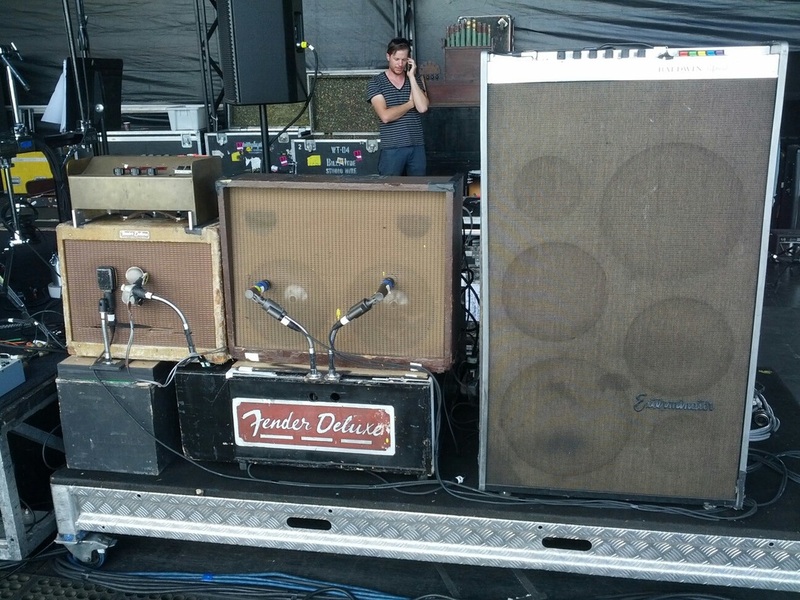 Neil's rig circa who knows..
Btw thank you Godfrey for posting these pictures! 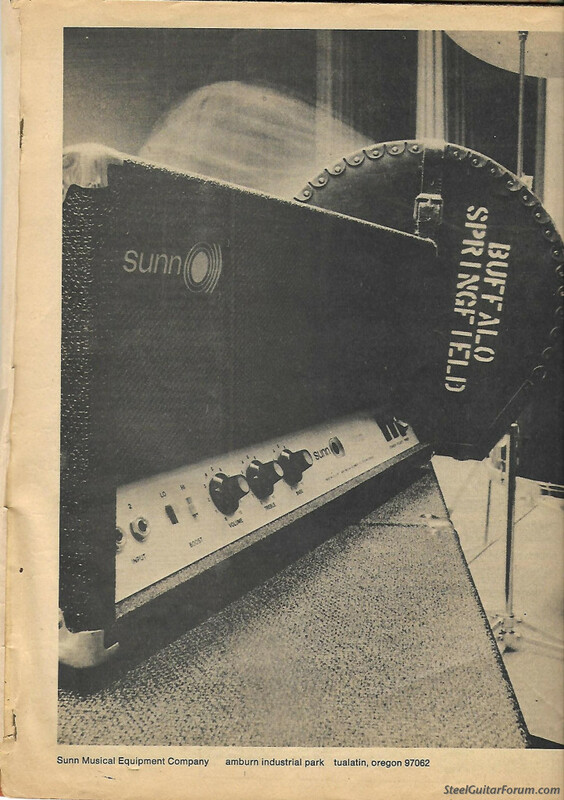 Here's an ad for Sunn amps in an old Hit Parader. Must be Dewey Martins bass drum case. Joachim I love those old gear ads. Really brings the feel of those days when these instruments were important parts of music. Today, although there is much to be thankful for in modern technology, things change too fast to get that kind of nostalgia going. I don't see any future pining for old versions of Windows and the sounds we got out of laptops running on that. Since these same group of musos were involved in more than one group that helped shape music, The Byrds, The Hollies, Buffalo Springfield, you can't deny the feeling one gets when you see them walk on stage, for those that understand this and more so for those who grew up with them. And to see them using the same gear they used back in the 60's is priceless. 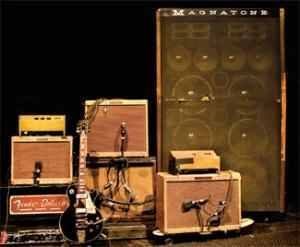 Steel guys might like Crosby's choice of amps. Although this thread includes a Beatle, Neil wrote some great songs. Great photos, Godfrey. You have an awesome job! Don’t get me started on Neil Young. My older brothers played the crap out of Buffalo Springfield, and Nowadays Clancy Can’t Even Sing was probably my favorite song when I was 11. Yeah, I know Richie sang it. But it’s a Neil tune, and I still think it’s great. I loved Broken Arrow too. I didn’t know what hell either song was about at the time, but that didn’t matter.